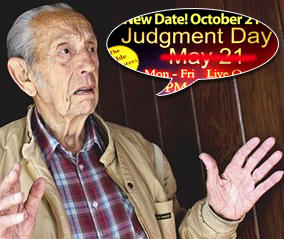 This is October 21st, the postponed or redefined date of the End of the World by Harold Camping. To put that in Biblical thinking, are you ready for the Lord to come today. If you are a recipient of the grace that is in Jesus Christ, that would mean what we call "the rapture". At first you may jump to the rehearsed answer "of course I am ready!" - however, are you ready to give account of the "things done in your body, whether they be good or bad?" as the Scripture says. There is no condemnation to those in Christ and this cannot be answering for any/all/part of our sin. This means the quality of the good works done in our body since we have received Jesus. Those works, words, sacrifices to God are either good or bad. Period. I think about this and I am not so sure that I am ready to stand before that trial of fire. I know that I have done many things in the name of the Lord, love, etc., but I am left with the strong impression and reality that many of them were done with motives that were prideful, selfish, and even self serving. It is a struggle to do these works that will be tried with pure motives. I think we have to have supernatural grace to do any works purely. I have scripturally stained thoughts also about "the crowns" or rewards that we will receive. We quickly quote the Revelation 4 passage about these being cast at Jesus feet, and He certainly is worthy of that - but the passage we quote is not the passage of the saint's crowning, but of the "24 elders of heaven". Sometimes this "casting crowns" is a scapegoat for believers not to realize that what they are doing right now will have eternal impact on their standing in heaven. It is not like we will cast the crowns and then we all will be equal. As in Rev. 4 with the elders, there is ranking in heaven. We see that discussed with James and John's mother in the gospels who wants her sons to sit on the left and right of Jesus when He comes to power. What I am saying is that your works as a believer do matter and will be rewarded accurate to your service, love, sacrifice, faithfulness. This reward will be played out in your Millennium and perhaps heavenly ranking. This is also illustrated by the parables of the talents when the managers are rewarded according to what they have done with the money entrusted them. So, I return to Judgement Day today. Are you ready? Understanding that what you have done on this earth continues into eternity, are you ready to meet the Lord? At a time I thought I was. I tried; guess I was baptised in dirty water. As a "babe in Christ" my wife did not join in devotions with me as she had the TV and books. After 45 years of marrage we are seperated. Too bad she didn't hear your summer sermans on marrage;as her church no longer has Sunday evening service, she attends Lighthouse sunday evenings. I am sure your sermons were greately helpful to many people;and going to church for most of my 64 years;never heard of a pastor speaking on this subject. Seeing your sermans on the internet, I can see you are a pastor who preaches the word of God, and not a "feel good" sermon.